Paladins, the free-to-play team-based shooter announced by Smite developer Hi-Rez Studios back in August, will equip players with various sorts of guns and character classes, as you'd expect from such a thing. But it will also feature strategic elements—team must destroy the enemy's base while protecting their own—and character progression enabled through collectible skill cards. It's a top-heavy description that doesn't exactly roll off the tongue or a Steam tag, but it sounds like those extra elements are where Paladins may find its niche. Tom had some hands-on time with it in October and said that it was a bit repetitive, "with weapons that lack the satisfying feedback I’ve come to expect from a shooter." But the deck building worked well, and "picking cards forced me to think critically during a match," he wrote, even though the choices he made didn't manifest in the field to the extent he expected. That's the sort of thing that Hi-Rez could address in the closed beta, which got underway today. Servers are currently only online from noon to midnight EST, but will go 24 hours as soon as possible. There will be wipes now and then throughout the test, but any purchases made will be permanent. 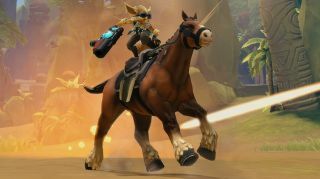 Speaking of purchases, access to the closed beta can be had immediately by buying the $20 Paladins Founder's Pack, which includes an exclusive mount and 20 card chests. Alternatively, you can put your name in the hat at Paladins.com and take your chances with the closed beta lottery. Or, prior to noon EST on November 18, try Plan C: Enter to win one of the 500 Paladins closed beta keys that we're giving away, just because we care. Paladins is expected to come out sometime in 2016. Have a look at the video below to find out more about the game's five Champions.